The MacGyver Reboot has been filming the pilot episode for its second week - and stopped by for a visit at the ComicCon in San Diego! On the same day, Lenkov posted several pictures of George Eads in full military gear, looking like a sniper trying to take out the bad guys. Lenkov included a picture with "Aloha" written on the rifle; therefore sending a "little love letter" to his crew filming Hawaii 5-0. On the same day, he posted a short video of Lucas Till as MacGyver cutting some wires while wearing a protection suit. Looks like he just saved the day again by defusing another bomb! Peter Lenkov introduced us to "Team MacGyver" by posting a picture with Lucas Till (MacGyver), George Eads (Jack Dalton), Sandrine Holt (Patricia Thornton) and Tristin Mays (Riley Davis?). Composer Keith Power has started scoring - and apparently needs lots of coffee while doing it. On July 19, we got several pictures of a tank on set. A tank that soon got invaded by bikini-clad women in heels while carrying weapons. Hmm. SkyDroneCinema called it a "hot hot day on set" while Lenkov asks the same question that fans have been asking on the MacGyver Online Forums and on the MacGyver Online Facebook Page: "What does this have to do with #macgyver???" Chris Payne Gilbert sure had fun with this scene, as did George's StandIn Mikey Leo and model Teresita Vicente (although she later deleted her Instagram picture stating she had been shooting Ninjas all day with a machine gun while wearing a bathing suit). While some fans were as happy as Lucas and George snagging Ninja-Shooting Bikini Babe India Batson for a picture, others were either confused or disappointed; stating that "Baywatch With Tanks" wasn't the image the show should be going for. I'm still guessing at what this scene should be. Opening Gambit? Weird Dream? Fantasy? Music Video for the Soundtrack? We'll see in September. On the same day, Lenkov posted pictures of a helicopter on set while SkyDroneCinema shared a video back from the Estate Party Night Shoot at the Swan House in which we get to know New MacGyver's fighting style. On July 21, Lenkov posted a picture of some paper clip art. Fans of the old show might recognize the shape - is this a hint for the plot of the new Pilot Episode and its title "The Rising"? While several members of the cast and crew travelled to San Diego, others stayed back in Atlanta for another night shoot - apparently on a boat involving explosions of two other boats. Several people caught the crew shooting still late at night, but didn't stay long enough to catch the explosions. Must have been a long shift for everyone on the crew. Location Scout Gonzo Rey sure was feeling the tiring night shoots by now. CBS had announced before that they would hand out a new version of the "MacGyver Multitool" and that fans would have the chance to take free rides in electric cars. 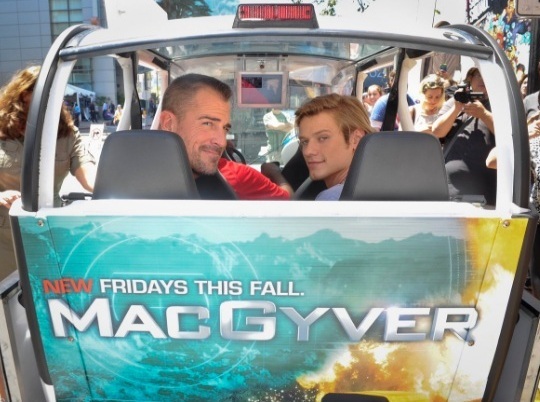 Lucas and George got to enjoy a ride while doing interviews. It didn't take long for visitors at Comic Con San Diego to share pictures of their paperclip, most of them complimenting the advertizing. Interestingly, the MacGyver logo on the electric cars and on the shirts of the Multitool-Promo-Crew is different: The SAK is gone. In the meantime, it has also disappeared from the logos on the official social media accounts. Let's hope it doesn't get replaced by a paperclip somehow, because I really liked the old logo. To be honest, I'm a bit disappointed about the change - partly because THIS is the only tool MacGyver really needs, but mostly because being from Switzerland, I was always very proud of a Swiss product so prominently featured in the most favorite TV show of my childhood. Thanks to MacGyver, until my former male classmates had to join the military service at the age of 18 I believed that the official SAK at that time was red (it was actually silver until 2008; now they're handing out a very different model in green). Especially Peter Lenkov and James Wan managed to ease a lot of the worries weighing on us fans. 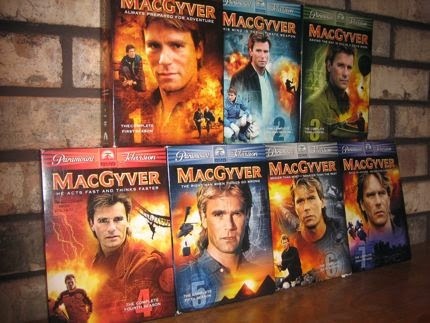 Wan acknowledged that MacGyver is "such a different hero from what we see on TV these days" and stated that they want to retain that spirit of a great role model blessed with intelligence and humanity. While the producers want to honor the legacy and won't turn Angus MacGyver into some kind of Jason Bourne or James Bond, Lenkov also said that they will update some of the techniques, meaning different shooting styles and editing techniques. Additionally, MacGyver won't be a "lone wolf" anymore but more of a team player (which has become a standard in almost every modern tv show, but I'm still not sure if this is always a good thing). 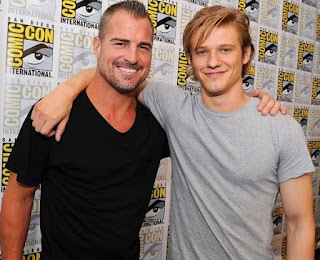 In the Roundtable Interview posted by Seat42F, Lucas Till admitted having catched some reruns in his youth, but not being an avid fan back then. He's currently on Season 2 for research purposes. George Eads stated feeling the pressure and the tiring shooting schedule, but also feeling very proud being part of this project. Seat42F shared another Roundtable Interview with Lenkov and Wan, where Lenkov confirmed that they would keep the Opening Gambits. 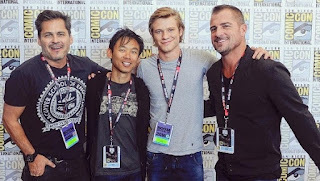 Regarding the challenges about setting the reboot into 2016, Wan and Lenkov stated that while today's world is very much digital and so many problems are solved with computers, MacGyver still thinks in analog ways. Wan always liked that MacGyver only turned to violence as a last resort; and while the show is set "in a modern world that is so violent", he wants the hero to keep using his brain for creative problem solving. 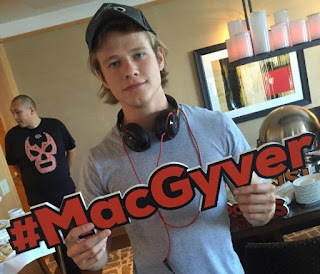 In the press junket interview posted by sandwichjohnfilms, Lenkov promised that we will see why Lucas Till is the perfect MacGyver. Lenkov is aware that people are very sceptical of this reboot and wants to retain the soul of the old show while introducing it to a new audience. For Wan, it doesn't matter what type of film he's making (action, horror or comedy; low-budget or blockbuster), because for him it's all about the characters and if the chemistry is right, then "the action and the set-pieces are just the cream on the cake that makes it all the more tastier". The article by USA Today confirms that the show will keep the voice-overs. During a video interview with ET Online, Lucas had joked about his stunt guy sitting on the sidelines - and he already paid the price for it, as the article reveals: Till (...) has persuaded producers to let him perform a number of MacGyver's tricky stunts. He sports a band-aid on his finger from a cut suffered grabbing the side of a serving tray at the end of a complicated kick-and-catch move. Let's hope he realizes that having a stunt person is actually a good thing, no matter how much fun it is to do the stunts yourself - otherwise, RDA might explain (and show) it to him. During last week, Central Casting Georgia has made several casting calls; e.g. for Ninjas, Korean workers and soldiers, Caracas guards or Asian hackers. They're also looking for old cars and mopeds and for a hand double - judging by the provided picture, probably for Lucas Till. Singer George Lott announced on July 19 that he will have a featured cameo role in the show - maybe even for the episode called "Baywatch with Tanks"? Peter Lenkov shared the information that it's only 5 more days with James Wan until moving forward onto the next episode. 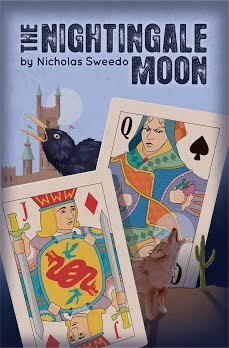 So far, we don't know yet its title or its director - but the casting calls indicate an Asian setting. Brian Durkin is back on the studio lot writing new episodes, so there will be more casting calls soon. Several times, Peter Lenkov had already posted pictures of the Griffith Observatory back in LA - MacGyver's home in the original pilot. The speculations and hopes of many fans turned out to be true when Pilot Episode Director James Wan posted a picture on July 23 of the crew shooting at Griffith Park in front of the observatory. New MacGyver is definitely going back to his roots. A lot going on this week! I watched all the comiccon videos and came away really impressed by what they all had to say. I had never heard James Wan speak before and haven't seen any of his movies, but I liked his demeanor and his answers. And Peter Lenkov is awesome. I can't imagine a better guy to lead this project -- he genuinely gets the importance of keeping the soul of the old show rather than just cashing in on the MacGyver name, and I get the feeling that the whole team has done their research (whereas I didn't feel that way with the first iteration of the pilot). Lucas and George do seem to have great chemistry. I haven't seen them in anything before (unless you count Lucas's Taylor Swift video! ), but they both seem like they can fit the bill -- Lucas as the calm, cool one and George as the zany Jack Dalton. I liked Lucas's description of watching "The Enemy Within" and how he was falling asleep and then woke up to MacGyver saying, "I'd say you're the ugliest woman I've ever seen." I'd love to hear more stories like that and what they thought of specific episodes and scenes from the original. Overall, it was great to hear them at comiccon and I'm excited to see what transpires! What Taylor Swift video was Lucas in? Have you never seen an episode of "CSI"? With Eads in it? You'd be in rare company have missed out on "CSI" entirely. I'm way behind on absolutely everything and with another political convention this week I'm likely to fall further behind but I'm gonna check out the interviews cited tomorrow night if I can. I have not seen even a minute of any of the CSI's, so I'm in the rare company! In fact, I know so little about it that I was just reading up on the different versions of CSI and was surprised that the wikipedia article didn't mention CSI New Orleans which I've seen previews for with Scott Bakula. Then I learned that the one he's in is actually NCIS, which is another show that I've never seen. 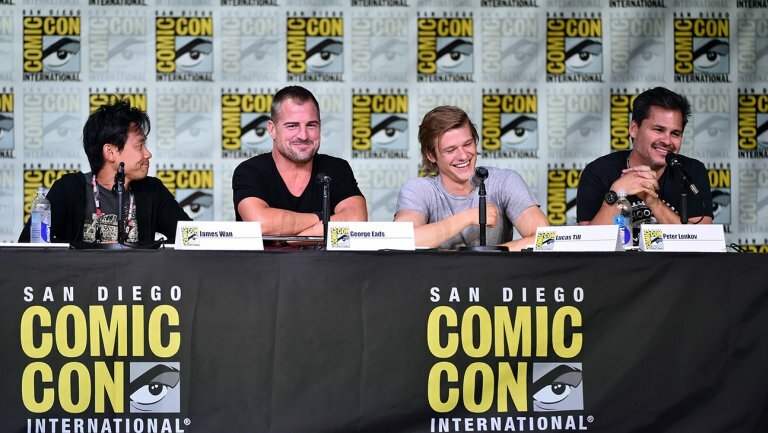 And it's worth skipping a few of the convention interviews to watch these MacGyver panels! Till sure looks like a youngster in that Taylor Swift video, which I guess makes sense since I think the song is about seven years old. I won't say that the "CSI" franchise wasn't completely without attractions as I saw a number of the original version with Eads and the Miami version that were well done. But for every good episode of either version, there were three of four that were pretty uninspired and forgettable....and some that were genuinely awful. I haven't seen much of the NCIS's, although I watched a couple episodes of the LA version that were in tandem with "Hawaii Five-O" episodes. It didn't do much for me at all. I think I've seen James Wan's "Saw" (2004) when it came out on DVD. Don't remember much about it besides the twist in the end ;-). "CSI Las Vegas" is still quite big on German speaking TV; I never watched it regularly but I have seen quite a few episodes. 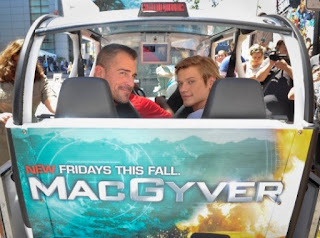 George Eads wasn't all that memorable to me, though but I always liked his character. I was very surprised about his voice because his German dubbed voice is so different. Thanks again for the update. While it sounds like they're trying to do it right, I don't get how a tank and bikini babes have anything to do with "MacGyver" either. Was it just a promotional prop from a clueless CBS executive? 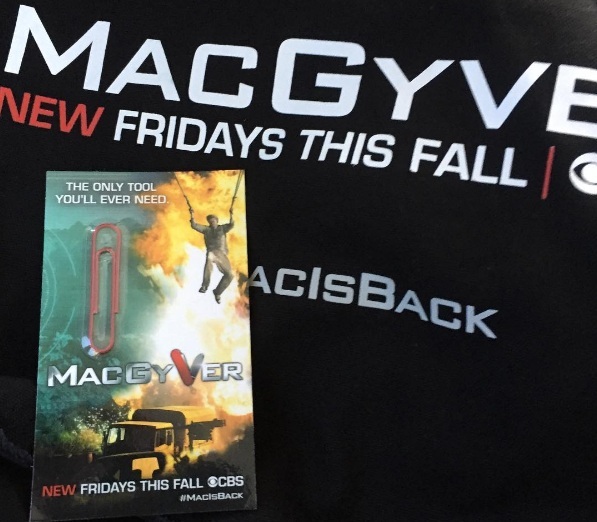 I also liked the Swiss army knife representing the V in MacGyver's name...and am disappointed to hear they're dropping it. I thought at first that maybe they had dropped the knife exclusively for ComicCon - because the writing is easier to recognize from afar on the electric cars and the shirts. But now that it's the same logo everywhere, it seems they definitely dropped it.